A Santa Maria man led California Highway Patrol officers on a chase Friday evening that ended with a crash in Paso Robles, resulting in a CHP investigator suffering undisclosed injuries. Shortly after 6 p.m., a CHP investigator observed a vehicle parked in a suspicious location on Linne Road approximately four miles east of Paso Robles. The investigator relayed the vehicle’s license plate number to the San Luis Obispo CHP dispatcher, and it turned out the vehicle was stolen out of Santa Maria. Additional CHP officers came out to the scene. 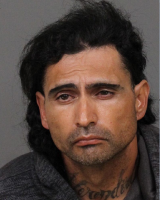 But prior to their arrival, Marcos David Rodriguez, 40, drove away in the stolen vehicle, turning westbound on Linne Road and heading toward Paso Robles. At Pennman Springs Road, as the stolen vehicle passed, a CHP officer pulled behind Rodriguez and tried to stop him. Rodriguez did not stop, and a pursuit ensued. Eventually, the driver turned onto Larkfield Place, which is a cul-de-sac. Rodriguez tried to make a U-turn, but CHP officers arrived and cornered him. The Santa Maria man then crashed into an undercover police vehicle, pinning himself into a dirt embankment. The crash injured a CHP investigator, who was treated at a local hospital and released. Officers arrested Rodriguez on charges of auto theft, possession of stolen property, felony evading causing injuries, and assault with a deadly weapon. Authorities booked Rodriguez into the San Luis Obispo County Jail with his bail set at $50,000. Rodriguez, who still remains in custody, is also charged with violating his probation and parole, according to the county sheriff’s office website.